Switzerland and Israel are two small open economies whose central banks intervened in the forex market after the outbreak of the Global Crisis.1 In both countries there are periods of discretionary interventions in which the central bank intervenes without preannouncing or committing to such policy in advance. There are also periods of relatively ‘strong interventions’ in both countries, where the central bank commits to either maintain an exchange rate floor vis-à-vis the currency of a major trading partner (e.g. in Switzerland with the euro between 2011 and 2014), or to buy relatively large preannounced quantities of foreign exchange (forex) per period (e.g. in Israel between 2008 and 2009) (Wypolsz 2015, Cukierman 2016). Figures 1a and 1b, respectively, show the behaviour of the nominal and effective exchange rates in the two countries. The figures show that during the decade that started in 2006, the domestic currencies and the effective exchange rates of both countries were subject to similar trends of appreciation. Over the entire period this trend is somewhat stronger for the Swiss nominal exchange rate and virtually identical for the effective nominal exchange rates of both countries. 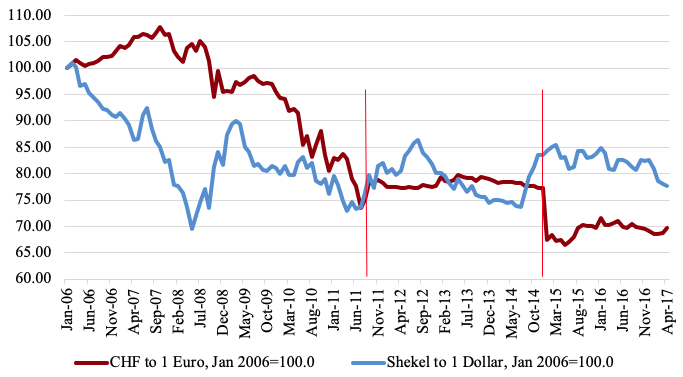 The figures suggest that the period of large preannounced fixed Israeli interventions that started in March 2008 was preceded by unusually large appreciations in both the nominal and effective rates of exchange of the Shekel. 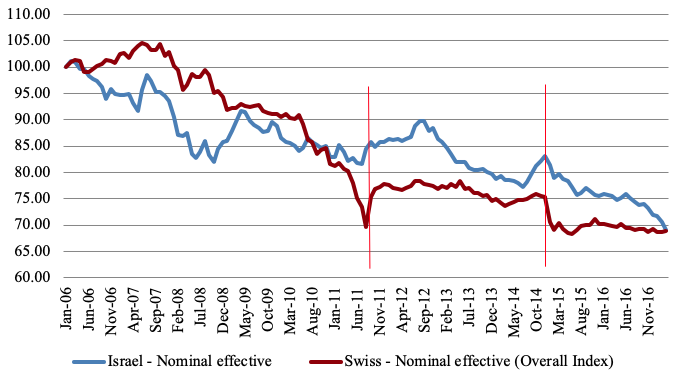 Similarly, the September 2011 commitment by the Swiss National Bank (SNB) to prevent appreciation of the Swiss franc beyond 1.2 francs to one euro was preceded by relatively swift and large appreciations in both the nominal and effective exchange rates of the Swiss currency. Notes: The vertical red lines show the period of strong intervention by the Swiss National Bank. When Israeli intervention was renewed in March 2008, its main objective was to raise Israel’s forex reserves that were deemed insufficient at the time in view of Israel’s forex obligations and its geopolitical situation. But, as those reserves grew rapidly during 2008 and 2009, it became apparent that the main, longer-term objective of intervention is the preservation of competitiveness in a world characterised by a shrinking volume of trade and extremely low interest rates. Maintenance of international competitiveness under similar world circumstances was the major motive for forex intervention by the SNB throughout the entire period. 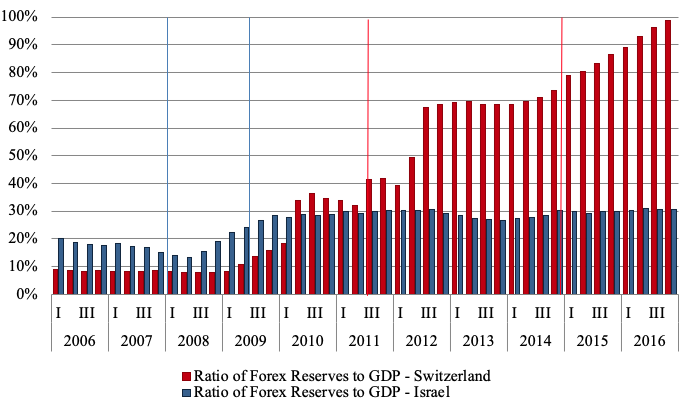 Figure 2 presents the evolution of forex reserves in Switzerland and Israel as a share of GDP between 2006 and 2016. Examination of the changes in the GDP share of reserves over those two periods reveals that, in both Switzerland and Israel, this share roughly doubled between the beginning and the end of the relatively strong respective intervention periods. Notes: The vertical blue lines show the period of the Bank of Israel’s strong quantitative intervention, and the vertical red lines show the period of the SNB commitment to an exchange rate floor on the EUR/CHF exchange rate. At the beginning of 2006 the Israeli GDP share of forex reserves was twice that of Switzerland. This pre-crisis difference was due to the particular geopolitical situation of Israel along with the fact that Switzerland is an important financial centre that (unlike Israel) does not need large amounts of forex reserves during normal times. As the global financial crisis entered its post-Lehman acute phase, the SNB reduced the policy rate to 0.25 during the last quarter of 2008 and started to engage in undisclosed amounts of forex intervention. 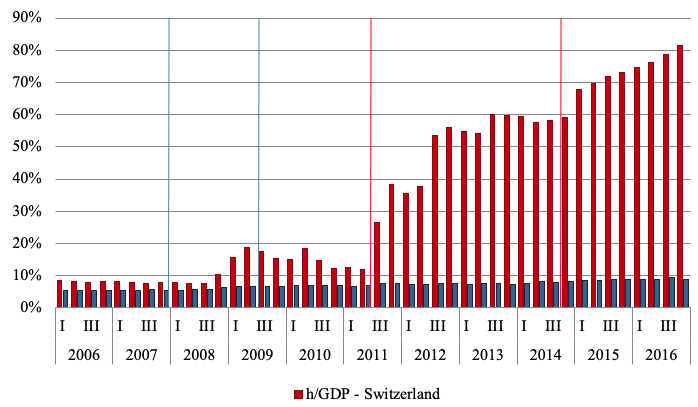 Switzerland reached the vicinity of the zero lower bound by the end of 2008 (Figure 3) and, following the lead of the Fed, engaged in quantitative easing. Since the share of trade in Switzerland is substantially larger than that of the US, the bulk of those quantitative easing operations took the form of purchases of foreign exchange denominated assets that resulted in swift increases in forex reserves. As a consequence, and as shown in Figure 2, between the beginning of 2009 and the second quarter of 2010, the share of reserves to GDP increased from less than 10% to over 30%. The commitment to a floor during the strong intervention period led to a further doubling of the share of Swiss reserves. Largely undisclosed amounts of intervention since then had increased this share to the size of GDP by the end of 2016. In the Israeli case, such interventions were sterilised whereas, from some point in time onwards, Swiss interventions were not sterilised at all. 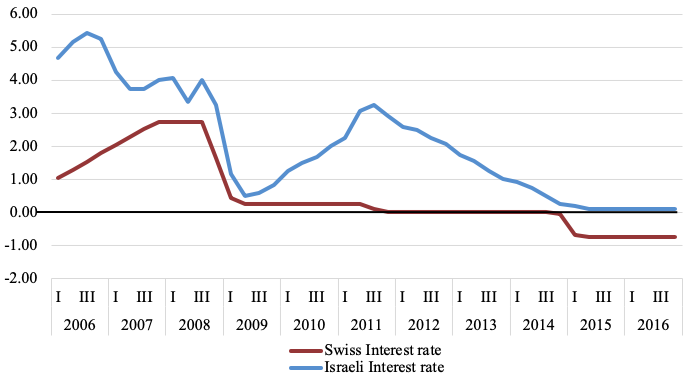 The SNB policy rate has been in negative territory since 2014.2 By contrast, after reaching the zero lower bound in 2015, the Bank of Israel’s rate remained stuck at the zero lower bound (Figure 3). Figure 4 shows the GDP shares of monetary bases in Israel and Switzerland. Comparing the evolution of those shares with those of forex reserves in Figure 2 suggests that, by and large, the Bank of Israel sterilises the impact of forex interventions on the base while the SNB does not. Essentially, since 2009 after its policy rate drops to 0.25, the SNB engages in quantitative easing operations similar to those initiated by the Fed around the same time. However, unlike the relatively insular Fed whose quantitative easing operations were aimed mainly at domestic assets, the SNB bought mostly foreign assets. As a consequence, the bulk of the SNB quantitative easing operations took the form of increases in forex reserves alongside the increase in the monetary base. This policy difference is traceable to the high degree of openness of the Swiss economy, along with the fact that the Swiss franc is a safe haven currency. In addition, the domestic bond market is too small to accommodate large scale asset purchases. Notes: The vertical blue and red lines denote the periods of relatively strong intervention in Israel and Switzerland, respectively. Sources: Switzerland - St. Louis Federal Reserve Data Base and SNB Data Portal; Israel – Bank of Israel Statistics Portal. Should small open economies engage in forex interventions? Conventional wisdom is that, at least during normal times, central banks should not interfere with the free operation of forex markets. This view presumes that forex markets correctly reflect the fundamental information in goods and financial markets, and that the resulting equilibrium is undisturbed by the existence of big players, and is therefore efficient in some sense. However this is not always the case, particularly so during financial panics, as recently demonstrated by the Global Crisis. In particular, small open economies are not always immune to the influence of big players. When temporary expansionary monetary policies by the major trading partners of a small open economy leads to the appreciation of the domestic currency, a lack of reaction by the domestic central bank exposes domestic producers to temporary foreign competition that, due to fixed entry and exit costs, may lead to permanent losses in production and employment. As long as the policy rate is strictly in the positive range, it may be preferable to offset the impact of foreign expansionary policies by means of interest rate policy. However this argument is no longer valid when the effective lower bound is reached. In this range the central bank has to rely on unconventional monetary policies. In a relatively closed economy like the US, such policies are implemented through the purchase of domestic assets. By contrast, in small open economies like Switzerland and Israel they are achieved by the purchase of mostly foreign assets. Should reserves be valued in domestic or in foreign currency? An important function of forex reserves is to shield the importing capacity of the country from various economic and geopolitical events that may have undesirable effects on its capacity to import and to access international capital markets. This capacity depends on the forex value of reserves rather than on the domestic currency counterpart of reserves. On the other hand, if, due to potential conflicts with other objectives such as price stability and employment, it is necessary to sterilise the increase in the base, the interest cost of sterilisation becomes relevant as well. When this is the case and the return on reserves is lower than the cost of sterilisation, an argument against ‘excessive’ forex reserves is that the CB loses money on those reserves. This cost is usually calculated in terms of domestic currency. Internal procedures at the Bank of Israel allow for this difference by measuring the rate of return on reserves in terms of a numeraire of foreign currencies that reflect the main currencies Israel uses in its foreign trade. Nonetheless, for the purposes of domestic accounting and potential transfers of profits to the Treasury, rates of return are calculated in terms of domestic currency. By contrast, the SNB utilises domestic currency accounting for both purposes. Furthermore, in Switzerland the magnitude of Swiss franc-denominated profits of the central bank is used to determine the size of profit distributions from the central bank to the cantons and the federal government. It is noteworthy that in both countries forex denominated returns are higher on average than returns in terms of domestic currency. This is not surprising in view of the fact that the interventions did not fully offset the appreciation pressures in both Switzerland and Israel. How can the trade-off between leaning against appreciations and ‘excessive’ reserve accumulation be improved? The short answer is: raise the fraction of riskier but higher-yielding, longer-term assets in the central bank portfolio and engage in more active portfolio management than is traditionally practiced by central banks. Table 1 compares the means and standard deviations of returns on reserves in terms of forex in Norway, Switzerland, and Israel. The fraction of stocks is highest in Norway, lower in Switzerland, and smallest in Israel. The table reveals that, correspondingly, the ranking by means and standard deviations is similar, supporting the well-known fact that higher long term returns go hand in hand with more variability. Source: Calculated from data in Tables 3 and 4 in Cukierman (2018). transfer the management of reserves to a sovereign wealth fund (SWF). the identity of the fund’s manager. There is widespread agreement that windfalls should be used mainly to fund long term national activities rather than current expenditures. The main options for management of the fund are the central bank, an independent body, or the treasury. At first blush, the management of a country’s wealth would appear as an additional natural function of the treasury. However, historical experience suggests that, when managed by the treasury, the fund may be used for the financing of current budgetary expenditures rather than for the funding of long-term national needs. It is therefore imperative to separate the management of a SWF from the current budgetary activities of government. Another important question concerns the specification of the purposes for which the net profits of a SWF are to be used. Whatever the ultimate institutional location of a SWF, appropriate legislation should assure that its funds are used mainly for financing long term needs of the economy and its citizenry. Since the temptations to use returns from a SWF for regular budgetary expenditures are strong, it is imperative that the list of items to be financed from this source be determined in advance by a public committee of experts and policymakers, and cemented into law. Furthermore, the institution in charge of managing the SWF should be given enough independence to resist political pressure designed to divert funds to current government expenditures. Cukierman, A (2016), “The conquest of Israeli inflation, its benefits, and current policy dilemmas ,” VoxEU.org, 1 April. Cukierman, A (2018), “Forex intervention and reserve management in Switzerland and Israel since the financial crisis: Comparison and policy lessons ,” CEPR, Discussion Paper 13186. Eichengreen B (2011), Exorbitant Privilege, Oxford University Press. Wypolsz, C (2015), “End of the Swiss franc’s one-sided exchange rate band, ” VoxEU.org, 19 January. Besides Switzerland and Israel, other small open economies such as South Korea, Sweden, the Czech Republic, and Columbia also engaged in foreign exchange interventions. The current negative rate of -0.75 has been in effect since January 2015. Further details can be found in Cukierman (2018). In Norway forex reserves are managed by a sovereign wealth fund. This is analogous to the ability of the US to extract seignorage revenues from the rest of the world, which Valerie Giscard-D’Estaing referred to as an “exorbitant privilege” already in the sixties (Eichengreen 2011).